With incomparable safety as our mission and decades of real world touring experience at our fingertips, our engineers have developed the Suspension Solutions™ line of rigging hardware. Whether you need couplers to hang your conventional or moving lights, round slings for your truss or high-quality chain bags for your CM motors you can count on Suspension Solutions™. Everything you need to support your system and fly your rig. Extruded aluminum couplers designed for quick and safe mounting of lamp bars, conventional fixtures and moving lights. Suspension Solutions couplers are available in a wide range of styles including Half-Coupler, Double-Swivel and Fixed 90 Degree Rigid configurations. These rugged couplers are uniquely designed to fasten securely to both 1 1/2″ schedule 40 black pipe and 2″ O.D. aluminum tubing. Lab Certified 1100lb working load and 8:1 safety factor. Manufactured to BS EN ISO 9001 standards. Now with a special wing nut featuring solid tabs that work with a wrench and won’t break off. Night after night, tour after tour, Suspension Solutions™ Round Slings stand-up to the rigors of the road. These versatile Endless Round Slings are ideal for use in vertical, choker, or basket hitch applications. The soft and pliable design easily conforms to irregularly shaped loads and allows for tighter chokes with an easy release. Durable double jacket protects the loadbearing fibers while the white core warning fibers alert you to damage. Baskets, bridles, and chokers. bring it on. Suspension Solutions. Wire Rope Slings are ready. Made with 7×19 galvanized air-craft cable and finished to exacting standards with heavy-duty thimbles and flemished spliced eyes, our Wire Rope slings take safety to the steel. Designed to accept ½” and ⅝” shackles. Hang your fixtures high and be safe. 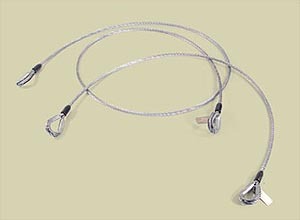 Suspension Solutions Safety Cables provide effective safety backups for all of your lighting fixtures and effects. Count on our Safety Cables to provide an effective backup in the event of fixture failure. Made with ⅛” Galvanized Aircraft Cable.